Saturday, 29 March 2014; Three Hundred and Sixty Two Days Old. Ayla had a restless night last night and although she hasn’t had a fever since yesterday, this morning Ayla’s stomach was still upset and she was miserable. Considering this is Ayla’s eighth day of being sick Hubby and I decided more need to be done than simply sitting around waiting for ‘it’ to ‘pass’. So at lunchtime we demanded to speak to a paediatric supervisor to try and get some answers. When the paediatrician came to see us she said that Ayla’s urine results had “only just literally come in that second” (conveniently) and that it was riddled with bugs. I’d had a sneaking suspicion for a few days now that Ayla might have been suffering a UTI but the doctors kept telling me “not to worry” about catching a sample because it was probably only gastro. Apparently Ayla’s UTI has stemmed from having had gastro in Thailand, which created the perfect environment for the e-coli bacteria to spread. Ayla was immediately given the first dose in a seven day course of antibiotics and we waited at the hospital to see how her body would cope. Ayla took the antibiotics like a champ and managed to keep it all down, so after a second dose at 7pm this evening we were sent home on ward leave. Ward leave isn’t exactly discharged though… It means we are still awaiting final urine results tomorrow that will confirm if the generic antibiotics Ayla’s been prescribed will kill the particular bug she has. It also means that if anything happens overnight we can go straight back to hospital and bypass the emergency room. It was SO good to get Ayla out of the hospital, and out of that damn isolation room!! Ayla seemed excited to be home too, crawling straight over to Cat Cat for a pat then off into her room to reacquaint herself. 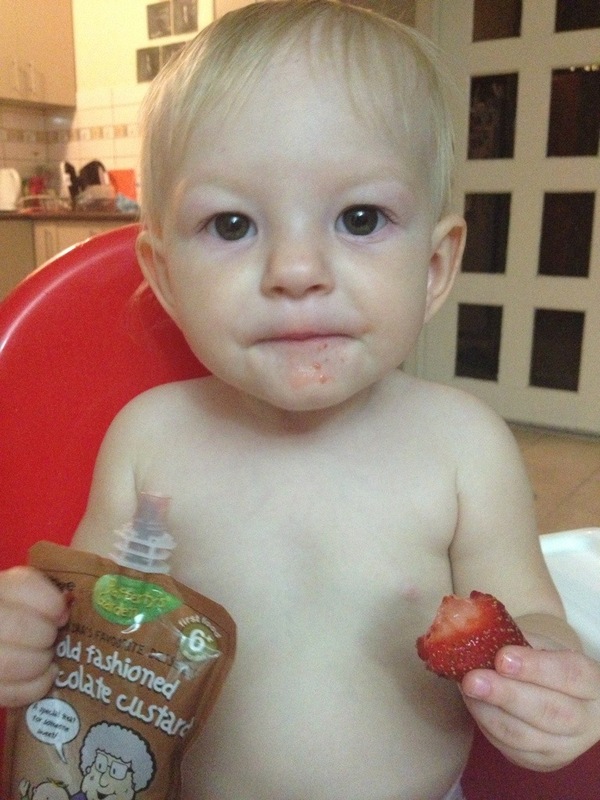 I decided to treat Ayla to a special homecoming supper to celebrate so I put her in her high chair and presented her with a fresh strawberry and some chocolate custard. Ayla was a sticky chocolatey mess in minutes and it felt good to have my little girl back! If all goes well tonight Ayla could be back to her normal self by as early as tomorrow and if not well, lets not worry about that just yet.